“Pay As You Earn” is a method of tax collection and payment method in which an employer is required by law (Income Tax Act Cap 470) to deduct income tax, hospital insurance (NHIF) and social security (NSSF) from an employee's taxable wages, salaries, bonuses, commissions, value of housing and any other income from an office or employment. It does not include earnings from “casual employment” which means any engagement with any one employer which is made for a period of less than one month. The employer is required to submit PAYE is submitted by 9th day of the following month to KRA failure to which attracts a penalty equal to 25% of the amount of tax involved or KES 10,000 whichever is greater. Also, penalty of 20% will be levied on PAYE tax remaining unpaid after due date. 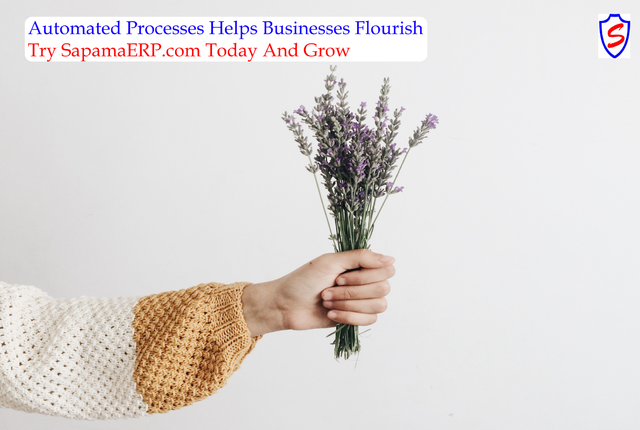 Subsequently, a late payment interest of 2% per month or part thereof shall be charged on amount of PAYE tax, including the penalty remaining unpaid for more than one month after the due date until the full amount is paid. It's the responsibility of the employee to file their annual tax by 30th June of the following year failure to which attracts a penalty of KES 20,000. 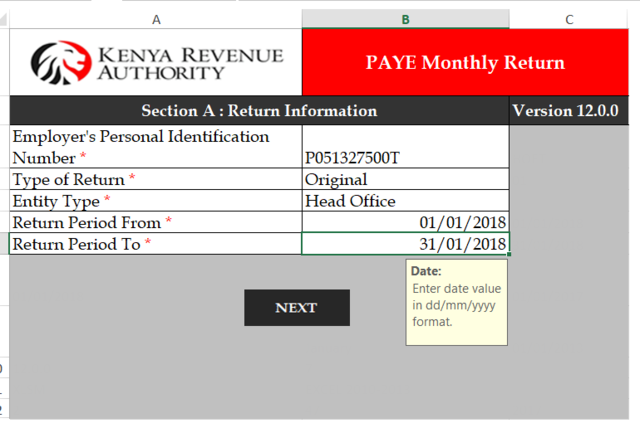 Step 1: Login to KRA iTAX Portal and download the PAYE excel sheet. The PAYE excel sheet that you need to download is found under the “Returns” menu item. Go to "Returns" Menu > File Return > Select "Income tax – PAYE" > Click "Next" > Download File. 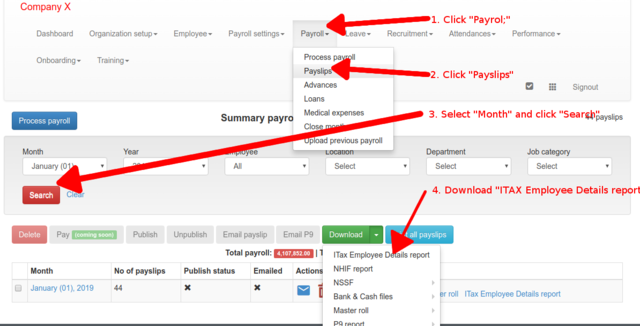 Login to SapamaERP.com, Go to "Payroll" Menu > Click on "Payslips" Search for the month > Click "Download" > Click "iTAX Employee Details Report"
Unzip the file downloaded in step 2 and open it. Fill as required and click 'NEXT'. This should bring you to the "Employee Details" section. 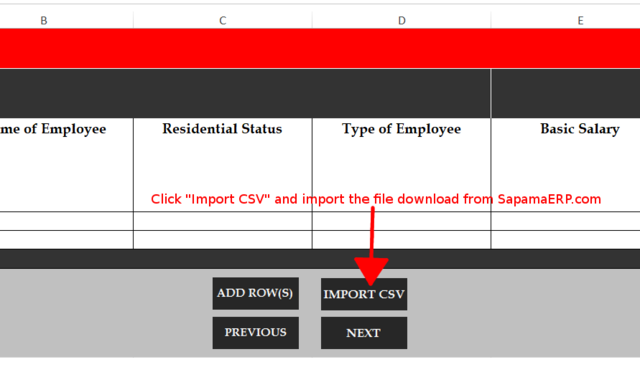 Use the 'IMPORT CSV' button to import your csv file from SapamaERP.com. Your employee details with then be populated. Once uploaded click through the sheet to ensure everything is correct. Pay special attention to the last two columns, AH & AHI. These will show you KRA computed PAYE vs your own self-assessed PAYE from your SapamaERP.com payroll. You'll then generate a Zip file that you'll upload onto Itax. You need to generate a payment slip for the tax obligation. The payment slip is what you will use to make a payment for this liability at the bank. Go to "Payments" > "Payment Registration"
Finally, print the “Payment Slip” in 2 copies and take to your local bank with a cheque for the amount indicated on the payment slip. One of those copies will be kept by the bank as an indication of your payment while the other one will be stamped and given back to you as your receipt. This is a very important document as it shows that you have paid your PAYE. In case the bank has an issue with their systems and miss to register your payment, you can always fall back to this document as evidence for the payment. iTax also sends you a confirmation email when you have made a payment and you can always check your “General Ledger” on iTax for verification.